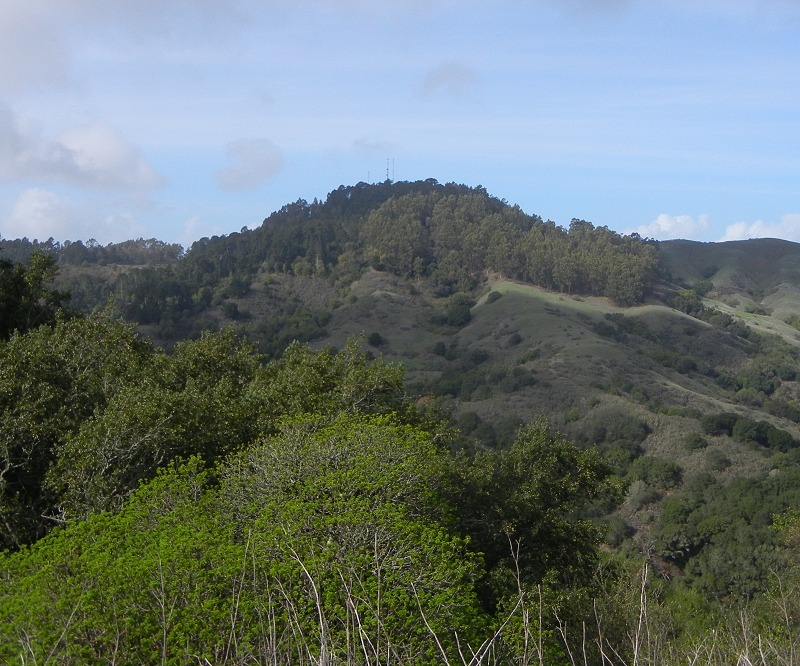 The ridge crest is held up by the Claremont Chert (Tcc), while Skyline Boulevard and Arrowhead Drive, running parallel just to its south, go through the crumbly Sobrante Formation (Tsm). 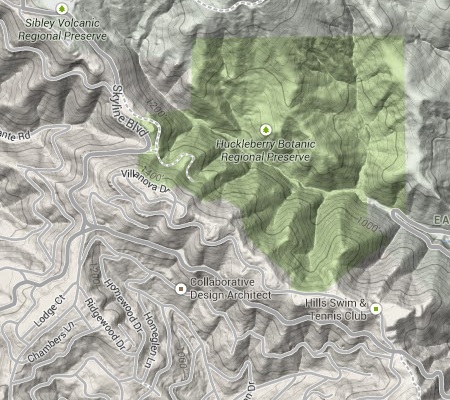 (The other formations are the Orinda Formation, Tor, and the unnamed Eocene sandstone of upper Shepard Canyon, Tes.) 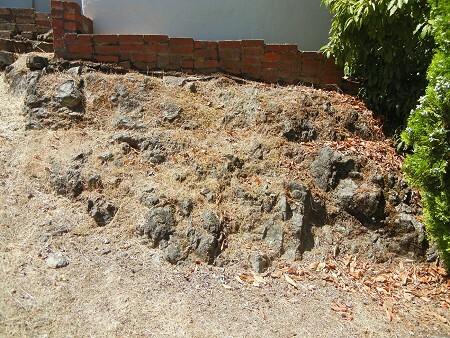 Here’s the chert exposed at the west end of Manzanita; it and the next two photos click bigger. The views are terrific. Here’s the view north over the Huckleberry saddle to the smaller ridge of Claremont Chert that Elverton Drive skirts. The middle of Manzanita offers fine views of Round Top. 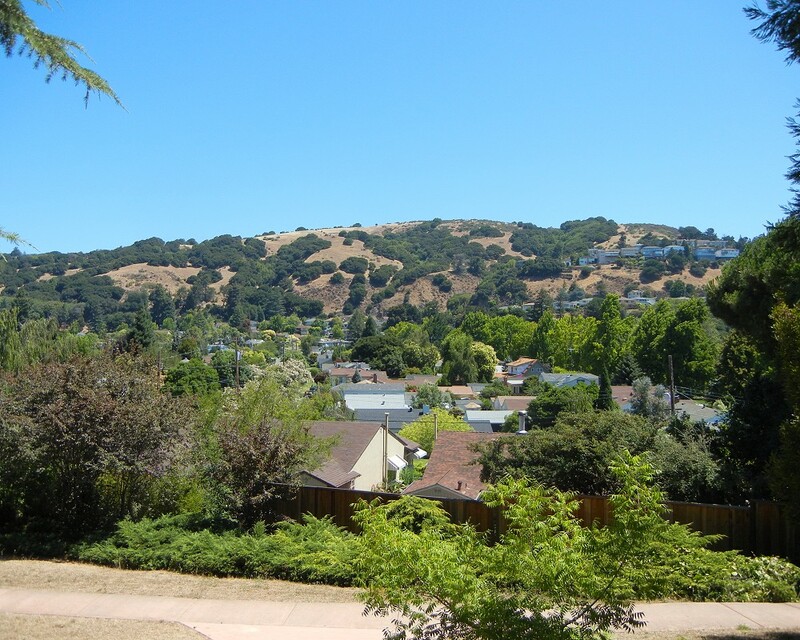 And the other end of Manzanita, past the unexpected Hills Swim & Tennis Club, is another saddle at the top of Shephard Canyon where the road to Canyon and Moraga crosses the hills. More than anywhere else in Oakland, this is an island in the sky. 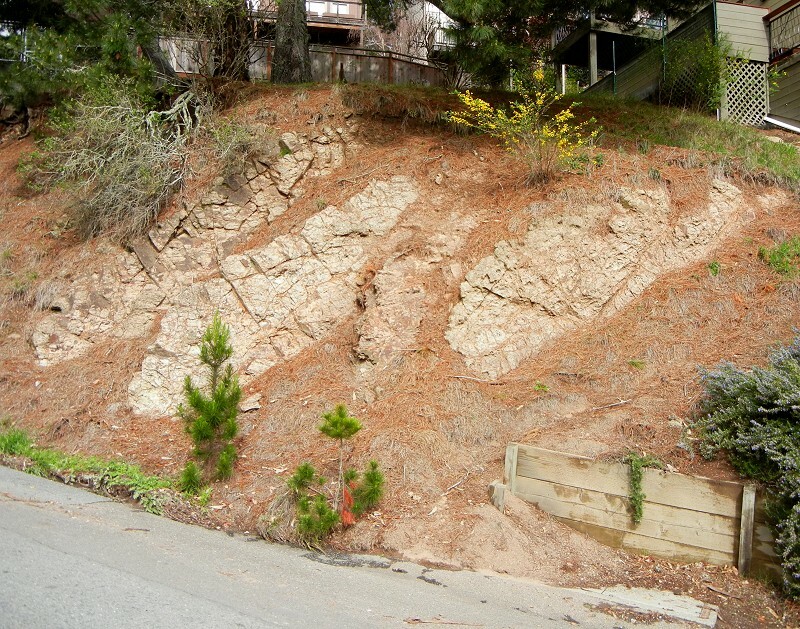 The big hill is on the east side, across the Hayward fault (the black line from the lower right corner). The little hill is on the west side, butting against I-580. The road on its west side is Middleton Street, so I give the hill that name. I didn’t realize it when I poked around there earlier this month, but the hill is mapped as San Leandro Gabbro, of Jurassic age. The rock doesn’t show itself very much, but here’s a small exposure. Next time I’ll bring a hammer. 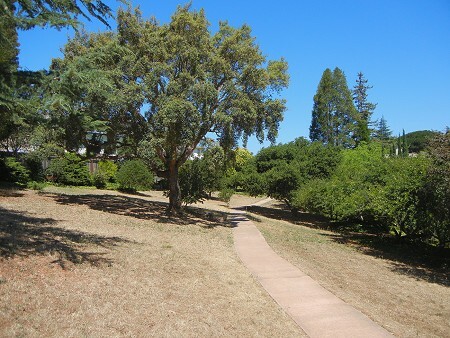 The highlight of the hill is the little private park inside the ring of houses there, just a microscopic piece of the original oak meadow (although this is actually a cork oak). From there you get a nice view of the big hill. The fault runs along the foot of the hills, behind the homes in the center and in front of the lower set of homes on the right. Click the photo for a big version. 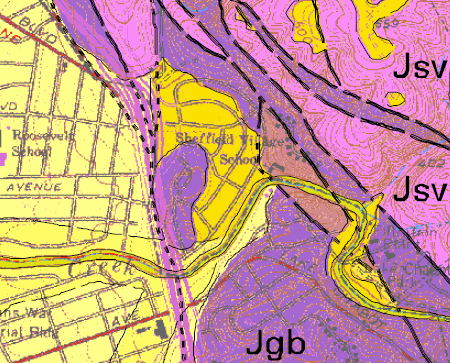 Bella Vista hill is part of the big Pleistocene alluvial fan that sprawls across the middle of Oakland, as shown by the “Qpaf” code on the geologic map. Bella Vista hill lies in the polygon defined by Park Boulevard, East 34th Street, MacArthur Boulevard, 14th Avenue, East 18th Street and 8th Avenue. All of those street run in valleys or saddles, except that East 18th is on a break in slope. The numbers refer to the following photos, taken from across or in the valley of 14th Avenue Creek. The hill is low on its bayward side, as shown here from E. 22nd Street. It has a corrugated surface, such that 9th, 10th and 12th Avenues run on high ground and 8th, 11th and 13th run up declivities. Higher up on the hill, the ground is steeper and the allee of palms marking the former Francis Smith estate is the defining feature of the hill. The top of the hill has two eminences. The more dramatic one is on the south where Highland Hospital frowns down upon the stream valley. Hospitals, like schools, were traditionally sited to take advantage of fresh air. Highland Hospital took its very name from this practice. Here’s a view of the whole hospital complex on the southern boss of the hill. The northern knob is higher, exceeding 200 feet elevation. At its high end, 10th Avenue becomes Bella Vista Avenue and curves across this peak. Old palm trees from the Smith estate mark it from a distance. Borax Smith knew what he was doing when he picked this hilltop for his home base. The hills on the fan to the south are a bit higher, but the views to every other direction were unimpaired from that spot. 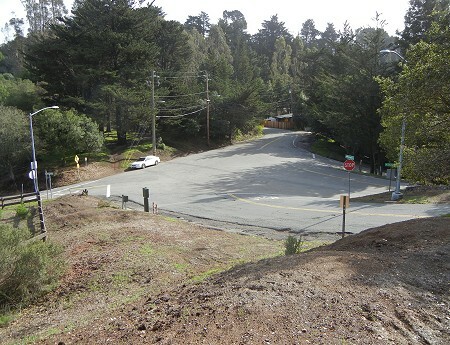 If you want to walk the crest of this hill, go up 10th or 12th Avenue and jog across to 13th and take it all the way up to the I-580 overcrossing. Bella Vista hill is my name for the lobe of the big Pleistocene alluvial fan (see the geologic map) lying between Haddon Hill and San Antonio hill. 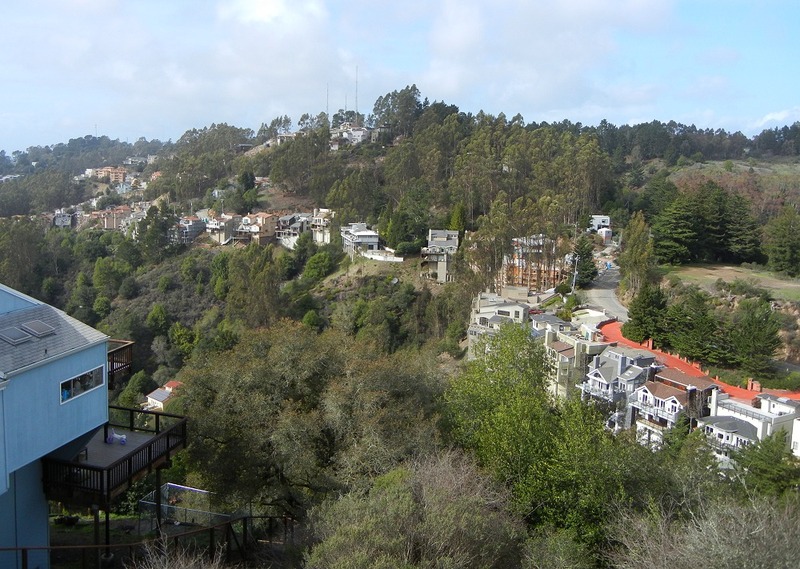 This view is from the south edge of Bella Vista hill, at 13th Avenue and E. 23rd Street, looking at the steep northern side of San Antonio hill. The valley separating the hills houses a stream called the 14th Avenue Creek on the watershed map. A long tongue of marshland once extended up 14th Avenue that is now a flat park between 14th and 15th avenues. Across that valley, San Antonio hill rises to about 225 feet at San Antonio Park, just a few blocks from the water’s edge. It is the most prominent part of the fan, as seen from BART. The north edge of the hill is much steeper than the slope we’re standing on, the south edge of Bella Vista hill. So that’s three hills in succession that have this asymmetrical profile: Haddon, Bella Vista and San Antonio. That pattern does not continue, though. Now that I’ve walked all over Bella Vista hill, I should present it next.